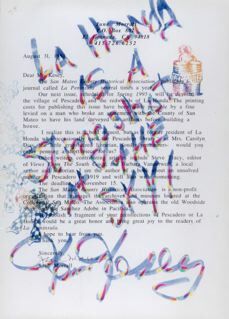 In August, 1995 I mailed a letter to Ken Kesey–the famous novelist, counterculture hero and former controversial La Honda resident–asking him to contribute a story, even “a fragment,” to an issue of “La Peninsula,” the San Mateo County History Museum’s journal. I was a member of the museum’s board of directors and I knew an article by Mr. Kesey would shake things up in the sometimes staid publication. Hey, I didn’t really expect a response from the author of the highly acclaimed “One Flew Over The Cuckoo’s Nest (1962)–yet, what’s the harm in keeping my fingers crossed? Turned out fingers crossed helped because a few months later my original, letter typed on a white sheet of paper was returned to me, forever altered. Ken Kesey, the real life central character in Tom Wolfe’s, “The Electric Kool-Aid Acid Test” (1968), responded with a double blast of psychedelic energy. Kesey, who led his band of Merry Pranksters on a continuing adventure “tripping out” in the redwoods of La Honda, couldn’t resist the opportunity to play a prank. What he did was magically turn an ordinary sheet of white typing paper into an extraordinary work of art. At least I think so. You be the judge. With Kesey’s creative contribution (in lieu of a story) I still needed one, a story, I mean. In 1964, Lee, then a San Mateo Times reporter, interviewed Ken Kesey, whose latest book, “Sometimes A Great Notion” had been published. Kesey was already nationally renown for “Cuckoo’s Nest,” a smash Broadway play destined to become an Academy Award-winning film starring the irrepressible Jack Nicholson in 1975. “Cukoo’s Nest” was based on Kesey’s personal experiences while working in a Menlo Park psychiatric ward–where experimental drugs were administered to the patients. Reporter Lee Quarnstrom was a great admirer of Kesey whom he interviewed in the author’s neck of the La Honda redwoods. Some years later, Tom Wolfe, the great observer of contemporary culture, made the same trek, resulting in “Kool-Aid Acid Test.” Wolfe described Kesey’s home as a log cabin surrounded on three sides by Sam McDonald Park, with a creek flowing nearby, all as photogenic as a Merry Christmas card. Highway 84 slinked by in front of the cabin, reached by crossing a wooden bridge. Kesey had the perfect location with no neighbors. Though drawn to the mountains and the solitude of the fresh-scented redwoods, Ken Kesey was not anti-social, quite the opposite, but it was the right backdrop for this counter-culture hero. The vibes were so good that Lee quite his newspaper job and moved to La Honda to be near Kesey and the counter-culture scene that was then evolving in San Mateo County. “We goofed off, smoked pot and listened to lots of rock ‘n roll,” said. Quarnstrom. They also took LSD, popularly called “acid,” legal at the time–and the live rock ‘n roll music was provided by a band later to become world famous, the Grateful Dead. “Kesey became a counter-culture hero,” Lee Quarnstrom told me, “because he was ahead of the curve of counter-culture that developed in the 1960s.” He was on the cutting edge of “acid tests,” long hair, and Eastern mysticism. Soon Kesey bought a 1939 International Harvester school bus equipped with bunks, benches and a fridge installed by the former owner for his children. The old bus was christened with the famous destination sign that read, “Fuurther.” Yes, I spelled it corrected. Two u’s. Fuurther. At the wheel of the bus was the unstoppable Neal Cassady, the real-life hero of Jack Kerouac’s beat generation novel, “On the Road” (1957). Kesey’s first project for the Merry Pranksters was to paint the bus with yellow, blue, orange and red Day-Glo Paint. When they were finished, it was a yellow, blue, orange and red bus. Somewhere in the pounds of Kesey material I downloaded from the Internet, there was a report that the Day-Glo painted bus may have been donated to the Smithsonian Institution in Washington, D.C. Well, was it, or wasn’t it? I called David Shayt, whose official title was: Smithsonian Collections Manager, Division of Cultural History. Shayt said he had visited the Oregon farm where Kesey had moved from La Honda with intentions of acquiring the famed psychedelic school bus for the Smithsonian’s 20th century collection. All was not lost, however. While searching for memorabilia in the barn, he discovered a six-foot tall multi-material, multi-media billboard, probably created in La Honda. Shayt said psychedelic colors covered both sides of the sign as well as fingerprints, drug paraphernalia and cartoons. He decided he had to have the sign for the Smithsonian. While Kesey and the Pranksters were “freaking out” in La Honda, the locals were getting paranoid about the new residents–and there were more serious problems. Although a novelist of great stature, “the authorities viewed Kesey as a menace to society,” said Lee Quarnstrom. And in April 1965 San Mateo County sheriffs raided the log cabin house, arresting some 14 people on marijuana charges, including Quarnstrom and Ken Kesey. While charges were dropped against most of the Pranksters, Kesey was sentenced to six months at the county farm, coincidentally located in La Honda. The local merchants saw that sign and got their guns out. They watched the swarm of swarthy-looking Hells Angels in black leather roar across Kesey’s wooden bridge on motorcycles. Quarnstrom said the Angel’s first task was to collect money for beer. That might have helped smooth relations with the La Hondans but soon after Kesey and the Pranksters left the log cabin and moved to a place they called “the Spread” on the outskirts of Santa Cruz. That was in 1965. A year later, Kesey and his wife, Faye, moved to the farm in Oregon, where the author lived until his death following an operation for liver cancer in 2001. Ken Kesey, an American original, must have been a calamity to the La Hondans. Now, decades later, the genius of the man can be more fully realized. La Honda is richer for the brief time Kesey and his band of Merry Pranksters played in the beautiful redwoods. The San Mateo County History Museum is one of my favorite charities. Please visit the History Museum at the historic Redwood City Courthouse. This entry was posted in Ken Kesey, La Honda. Bookmark the permalink.